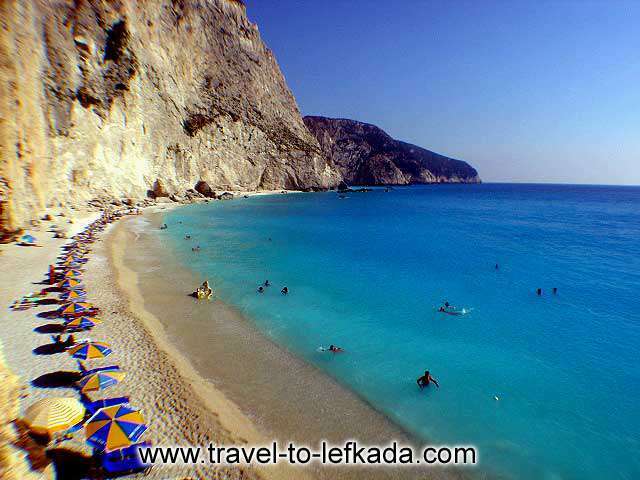 Porto Katsiki is Lefkada’s most remote beach, located at the island’s western shore. It is one of the most beautiful beaches in the Mediterranean and its white shore lies at the foot of a white vertical rock. You can access Porto Katsiki by car from the village of Athani, but be very careful because the road has many dangerous turns. Another alternative is by boat from the villages of Nydri and Vasiliki, but to actually get on the beach you need to walk down 100 steps. Porto Katsiki is divided in two pats by the huge vertical rock, which lies in the sea. The waters are crystal clear and deep and will surely allure you with their emerald colour. You will find canteens, parking spaces and taverns just above the beach, while if you continue your course from Porto Katsiki, you can reach the Monastery of Agios Nikolaos, which dates back to the 16th century. What is more, approximately 10km to the south is the cape of Lefkata with the white rocks. In Antiquity, Lefkata had a sanctuary dedicated to Apollo Delphinus, to whom inhabitants paid tribute by hosting feasts for calm seas. In fact, as tradition has it, ancient Greek poetess Sappho fell from this cliff, which is also called “Kavos tis Kyras,” obsessed with her passion for young Phaon.